Baton Rouge Families First was launched with the goal of empowering lower and middle-income families in Baton Rouge by encouraging education reform, promoting quality jobs through proactive economic development, and supporting initiatives that strengthen the family structure. With an escalating crime rate, failing schools, and a need for quality jobs, BRFF is dedicated to promoting policies to make Baton Rouge a great place to live and raise a family. Rispone, who in his day job is the CEO of ISC Contractors, has gotten involved in various conservative activist projects over the years. He’s been one of the drivers behind the Louisiana Federation for Children, the state’s most active school choice group. He was the chairman of Bodie White’s 2016 mayoral campaign which finished just shy of knocking off Sharon Weston Broome. And there were rumors, at least, that Rispone was involved in supporting the St. George incorporation effort in 2015, which one would expect will likely become an issue in Baton Rouge again this year. So it makes sense that Rispone would be involved in backing a group that muscles in on Together Baton Rouge’s space and gives it competition for the support of poor and working-class people. After all, it isn’t like anything Together Baton Rouge has done has been particularly helpful to the interests of social mobility among the underprivileged. Like the video says, wasting $18 million per year on buses nobody rides doesn’t help people become not poor. Fighting school choice and trapping poor kids in failing schools where they learn more about fistfighting than algebra doesn’t exactly give those kids a path toward acquiring marketable skills. And attacking the Industrial Tax Exemption Program, without which Baton Rouge’s economy – and particularly North Baton Rouge’s economy – would crater, taking with it thousands of working-class jobs and breaking the families who depend on them, doesn’t help move poor people into the middle class. What’s left after ITEP is dismantled is half a city where practically everybody is on welfare. You’re almost there now, but Together Baton Rouge’s activism against ITEP, if it resulted in ExxonMobil beginning to move its operations from its Baton Rouge refinery to facilities in, say, Texas as a result of grabby policy changes, would make everything north of Florida Boulevard a complete wasteland. If you’ll notice, there’s already lots of progress toward that wasteland status as is – despite six or seven years of nonstop Together Baton Rouge activism in torquing up the residents there over the usual left-wing causes. Which is why if Baton Rouge Families First is really interested in taking out Together Baton Rouge’s power base, as they seem to be, they’ve got a great opportunity to do so. After all, the way you move working-class people into the middle class is one family at a time – you need to promote things like keeping families together, graduating from high school and getting a job before you have kids, staying out of trouble with the law, staying away from alcohol and drugs, resolving conflicts without violence, acquiring and applying marketable skills, sound money management and how to save whenever possible, showing up on time and taking direction at work and the soft skills like proper manners and etiquette and speaking clearly. Poor people who can do all of those things will find themselves not all that poor in pretty short order, and there are lots of employers in Baton Rouge begging for employees who can do them. If this outfit can engage with poor and working-class people in Baton Rouge and help them connect with those employers, and the part of the town’s society with isn’t poor, they’ll be doing wonderful work – and in the process they’ll make Together Baton Rouge reviled and irrelevant. 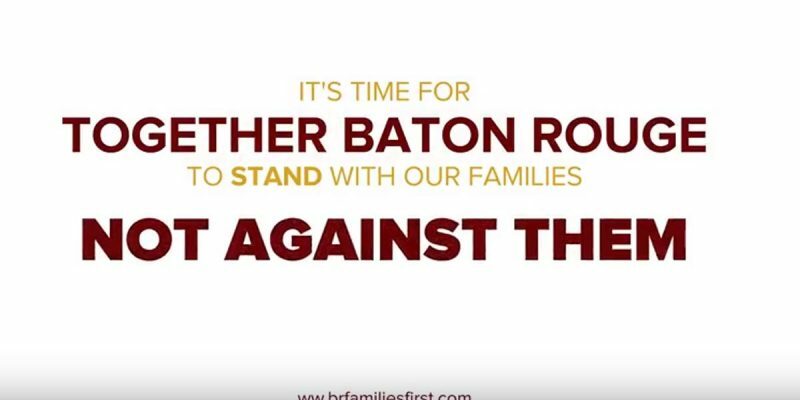 Baton Rouge Families First does have one thing going for them, which is this: with respect to its anti-ITEP advocacy, Together Baton Rouge has absolutely burned its bridges in the business community. The Baton Rouge Area Foundation and Baton Rouge Area Chamber, which essentially represent the powers that be in town and have been quite accommodating toward Together Baton Rouge up until recently, have both turned 180 degrees toward the Alinskyite outfit of late and are looking to take it down. If BRFF is the vehicle by which they’ll do that, and it ends up doing positive things in Together Baton Rouge’s core community, everybody wins. Everybody, that is, but the bigwigs in Together Baton Rouge’s hierarchy. But after all the damage they’ve done so far, does anybody care about their problems?